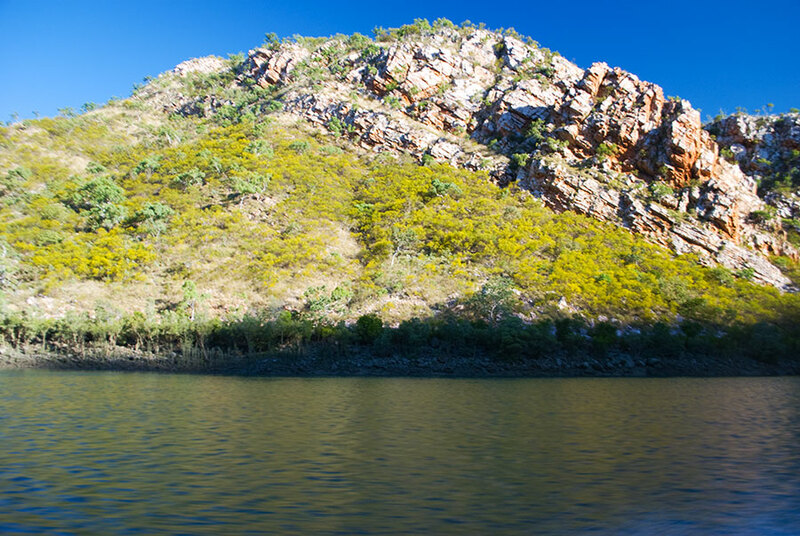 Well I seem to be on a roll lately, last month the Berkley and Drysdale Rivers up near Wyndham and yesterday I was lucky enough to fly up to Talbot Bay and view some of the most spectacular scenery in the world and then shoot through the horizontal falls in a speedboat. This is the only place on earth where you will witness the Horizontal Waterfalls. The falls are formed by the massive tides which rise at such a speed, large volumes of water are trapped behind the rock walls. The water is released again when the tide turns, causing the ‘waterfall’ to operate in reverse. The towering walls on either sides of the gaps are in fact a further 46 metres below the surface of the water. The smaller of the two gaps is approximately 7.5 metres wide whilst the bigger gap is 3 times that. The wide gap is capable of moving over 1,000,000 litres through it in one second. 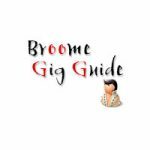 The coastline travelling north from Broome up the Dampier Peninsula is breathtakingly beautiful with wide white sandy beaches and serpentine tidal creeks. 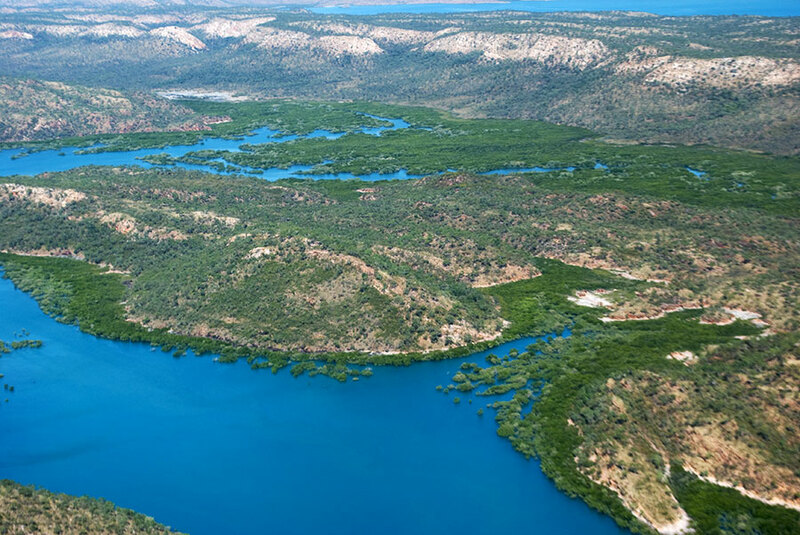 As you fly past Cape Leveque over King Sound and then on to the marvels of the thousand islands that make up the Buccaneer Archipelago group you don’t know which way to look first as the turquoise waters of the bays and inlets make for some breathtaking scenery. The rugged hills were ablaze with golden wattles, yet as we neared Talbot Bay I could see smoke rising from the hills and was soon to discover that large areas had been burnt. Apparently a helicopter for one of the big mining companies had dropped fire bombs all over the area to make it easier for them to do their exploration in preparation for copper mining. 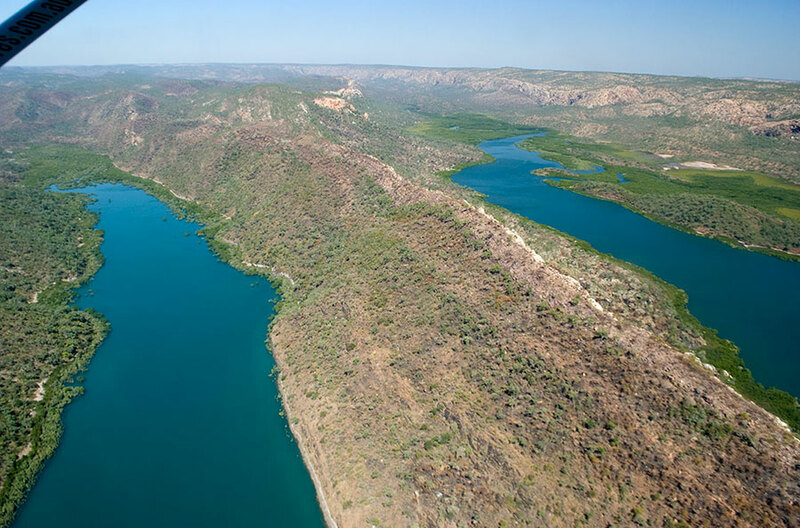 The Kimberley seems to be firmly on the agenda of big mining companies and our Government, to extract uranium, copper, bauxite, silver, gold, diamonds and the huge off shore gas basins. 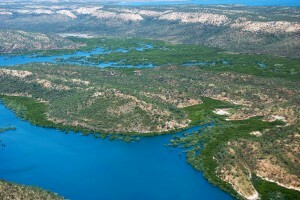 Anyone who visited these wild and remote pristine areas would be horrified to see them plundered, and everyone’s signatures joined the many hundreds before them in a growing lists of signatories to the petition to save the Kimberley. 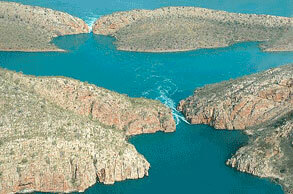 Click here to see some of the breath-taking scenery of the Horizontal Waterfalls. My wife and I visited the Horizontal Falls last year with Seaplane Adventures and it was spectacular. The scenery from the air was unreal and our ride through the falls exciting. Make sure you go when there are good tides. Thanks for your comment. The Broome No Gas Community is standing strong against the industrialisation of the Kimberley despite being up against a multi national company Woodside and the State Government who are hell bent on selling off all our natural resources to Japan and China. Thanks for sharing. I hope to visit this beautiful place before the mining companies wrecks havoc to this natural wonder. I just hope someone will stop them.